Why yes, I believe they did. And I remember the sauce had this distinctive taste that you just don’t find anywhere today. So I figured I’d give it a shot. How did it turn out? 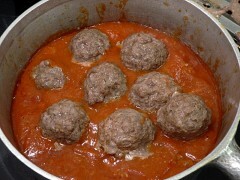 Let’s just say I won’t be pre-cooking my meatballs any more. NOTE: Of course I usually make my own spaghetti sauce from scratch. But if you were to keep a jar of store-bought sauce in the pantry for those nights when you don’t have time to make it, I wouldn’t think less of you. I didn’t include the recipe for these meatballs, because that isn’t what I’m trying to show here. But I will point out that there are no bread crumbs in these. Lots of people think that without them the meatballs will fall apart. Cook them in the sauce like this and that’s not an issue. 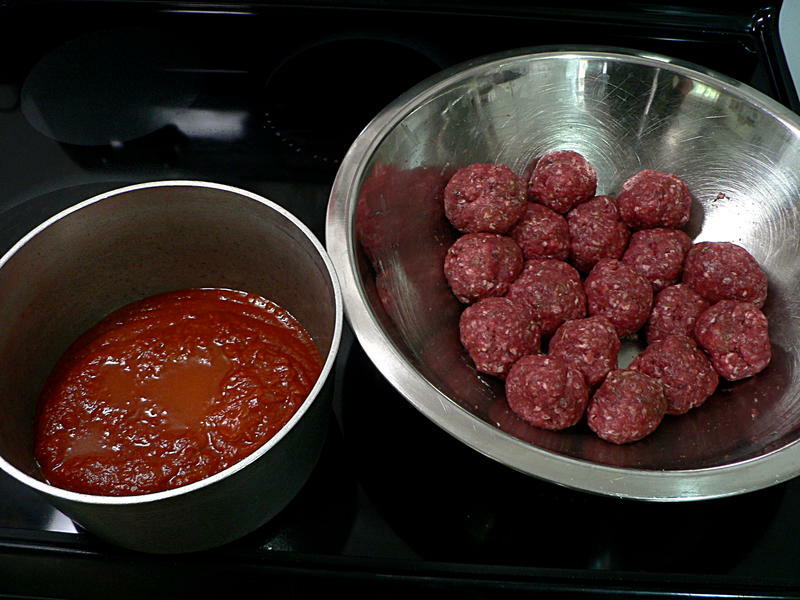 Just drop the raw meatballs (gently!) 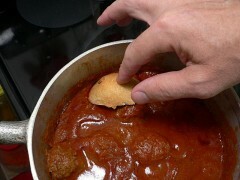 right into the cold sauce, then give the pan a shake to cover them. 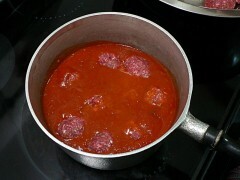 Turn the heat on medium until the sauce starts to bubble, then down until it’s only bubbling every couple of seconds. 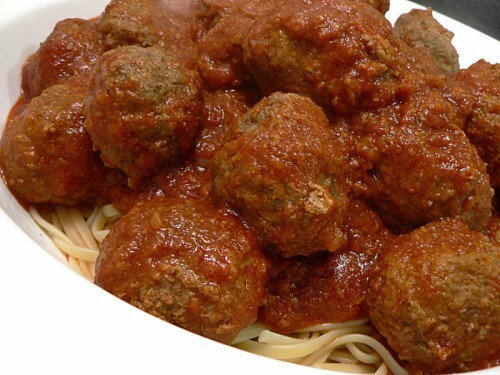 That’s only half the meatballs above. 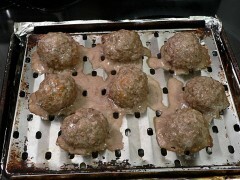 I was afraid if I stacked them in two layers before any of them were cooked they would stick together. 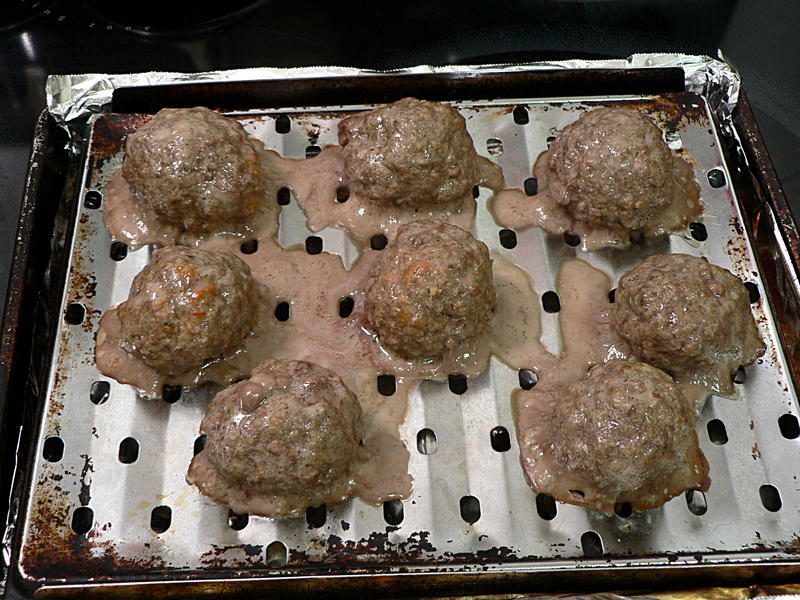 So the other half, I browned in the toaster oven for about 15 minutes before adding them. 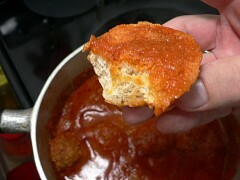 Next time I’ll just let the first batch cook for a half-hour then add the second half. In the next picture you can see there was enough sauce to cover all the meatballs. 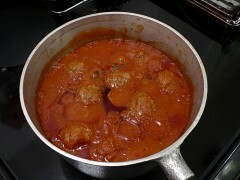 Then, a bit over an hour later, you can see that the color has changed a bit as the sauce reduced. 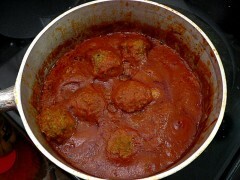 You can also see some of the grease from the meatballs floating to the top. Don’t just scoop it out. Dip it with a piece of crusty bread. Yeah, that’s right. It’s delicious. 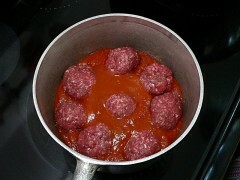 Now that you’ve soaked up the excess grease, you’ve got flavor-infused meatballs and concentrated tomato sauce. 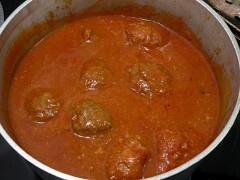 The sauce has been simmering for about two hours at this point. 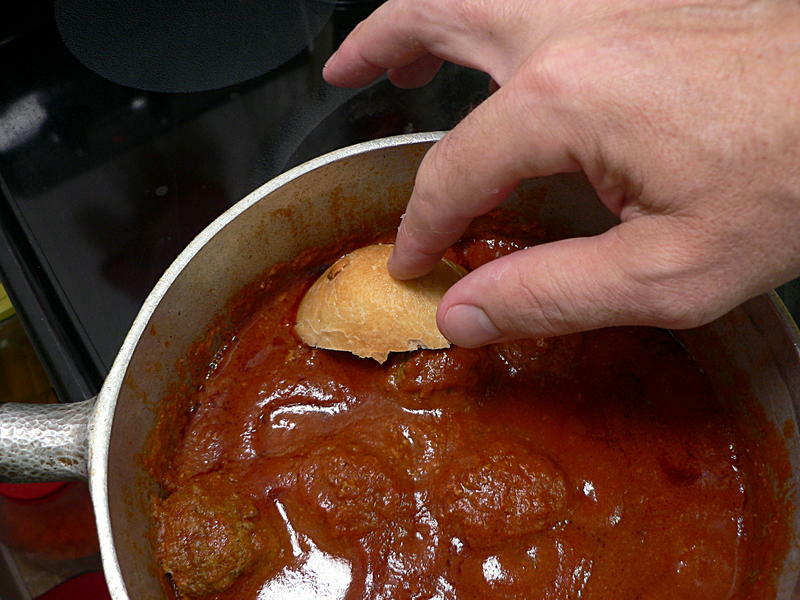 The way I remember this from my childhood the pot would be on the stove as low as it would go, or sitting in a crock pot, all day. I need to plan ahead a little more next time. PS: I’m so proud of myself. I made it all the way through without making any jokes about balls. Meaty, delicious balls.